Wholesale Mulch/Bedding | McNEILLY WOOD PRODUCTS, INC. 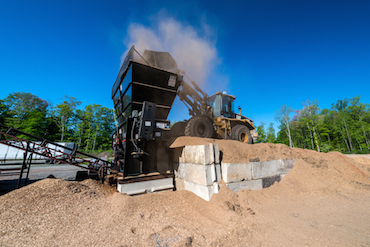 In 1998, McNeilly Wood Products, Inc. entered the wholesale mulch business as a way to eliminate wood waste generated by its facility. Old pallets and trimmings from the sawmill process are ground into mulch. The mulch is colored and available for delivery to landscape centers or wholesalers in McNeilly’s service area. McNeilly Wood Products, Inc. produces more than 20,000 tons of mulch each year. The chips are mixed with organic colorants — black, cedar red or chocolate brown— and is available delivered with a minimum order of 100 cubic yards on McNeilly’s own walking-floor trailers. What does McNeilly do with the nails? When pallets and waste go through the grinding operation, wood and nails go through together. At the top of the conveyor pulley is a magnet. When nails hit the magnet, they stay on the belt—wood chips go one way and nails another. The nails fall into a scrap bin which eventually fills a dumpster that is picked up by a scrap metal firm. Another by-product of McNeilly’s process is wood shaved into a size perfect for use by animals. This absorbent product is untreated, and smells like fresh-cut wood. The shavings are perfect for use as equine, canine or bovine bedding, in rings at equestrian or canine facilities or shows, in cages at zoos, and at dairy farms. The minimum order is 100 cubic yards delivered.